Affiliate program is ready for any publisher or blogger. How does the affiliate program work? - Apply for the Wedding.com.my affiliate program with our Affiliate Platform. - We will then review the application and accept you on to our program. - Choose from our wide selection of attractive advertising / promotion media and select the best ones suitable for you and integrate it onto your website. Our team is happy to assist you. - Making money is no longer an obstacle. Earn money easily. For each transaction that runs through your website, you will be paid a sales commission. Sales will be processed within 45 days after the receipt of the order. After 45 days once we verifies the orders and confirms, amends or declines the transactions. An amended transaction allows for partial refunds to ensure that the publisher is still rewarded. After processing, the payout is carried out directly to the Publisher. Example of partial refund calculation. to send back goods worth RM500; from the remaining amount of RM500, the publisher will receive a 5% commission of RM25. 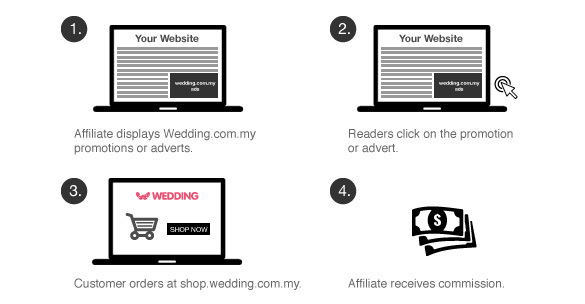 “I really encourage publishers to sign up with Wedding.com.my’s affiliate program. Wedding deals have always been popular, and our visitors are pleased with the range of deals that they provide. With frequent updates from their client management team, we are never in the dark about any marketing developments. Highly recommended” Hafiz Murat, Country Manager - Saleduck Malaysia.